As of today, I am six days into the Whole30 Program. It hasn’t been easy, especially as I watch my dear husband drink his craft beer every night, eat slices of my favorite bread with his dinner, and just generally snack on anything he wants while staying remarkably slim. Rrrgh. Though I’m not embarking on this diet journey to lose weight, I can’t say that the loss of a few vanity pounds wouldn’t be a nice consequence. Moreso, I hope to gain better control of my food cravings and improve a health condition associated with insulin resistance, PCOS. In December of 2011, I was diagnosed with Polycystic Ovarian Syndrome, a.k.a. PCOS. My doctor was frustratingly blasé about it, glossing over the fertility issues associated with the condition and prescribing an 11-day course of synthetic progesterone. Reading up on PCOS on the internet only confused me. I wasn’t overweight, which is common with PCOS, and I didn’t have any of the other outward physical symptoms associated with the condition. What confirmed the diagnosis was my irregular cycle (it’s been that way since I was a teenager), along with the telltale “string of pearls” ovarian cysts, clearly visible during an ultrasound. Most of the protocols for treating PCOS (and according to every credible source I’ve read, it can only be treated, not cured) assume you are obese. There are two types of PCOS, and I fell under the “Lean” or “Thin PCOS” diagnosis. It wasn’t advisable for me to follow the common recommendation for patients with traditional PCOS, to lose 5-10% of my body weight. However, the low-carb diet recommended to traditional PCOS patients also seems to help those with Lean PCOS in some cases. This is because the condition is believed to be largely tied to and affected by insulin resistance, regardless of the patient’s weight. In basic (read: completely reductionist) terms, when your insulin levels are more stable, your hormone levels tend to balance out, helping with regulating the menstrual cycle, as well as ameliorating the outward physical symptoms some women experience. The Whole30 protocol provides a great jumpstart for any woman looking to transition to a low-carb diet to treat PCOS. It eliminates all sugars, grains, alcohol, legumes, dairy . . . basically every high-carbohydrate food you can think of is off the plan, save for potatoes and plantains. I suppose that if you ate sugary fruits and starchy vegetables all day, every day, you could manage to skew the Whole30 to be a high-carb plan, but that’d be missing the point. Keeping those foods out of your diet (or limiting them to small servings) most days leaves you with a palette of ingredients naturally low in carbohydrates and completely devoid of “simple carbs,” the ones that cause insulin spikes and crashes. Even better, the plan rules out most foods that are common triggers of allergies and inflammation. If I happen to have any food sensitivities, I’ll find out about those as a result of the diet. Eating out at restaurants is not advisable on this plan, since it’s so restrictive. You have to be “that person” at the table, asking if every dish contains any of your banned food groups, and it’s not always possible to trust the answer you get. Better to avoid celebratory dinners out, pack your own meals, and just deal. It’s only 30 days after all. Oh, and try not to plan your Whole30 smack in the middle of say, the holidays. It’s easier when you won’t be attending events where you’ll be tempted to cheat at every turn. If you flub up a tiny bit (last week, I ate a piece of adobo chicken, which included soy sauce, and I accidentally had ketchup on my roasted carrots before I realized what I was doing), don’t worry about it. The plan’s creators like to remind you that “there is no perfect Whole30.” Your best is enough, providing you don’t go off the wagon and cheat in a big way, on purpose. This plan gets easier to follow every day, as you get used to the routine. It also makes you get creative with your snacks if you want to keep things interesting. 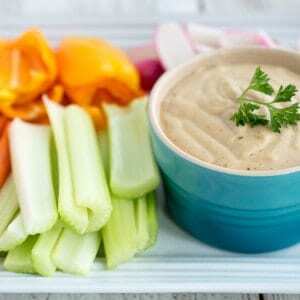 For today’s lunch, I chose to go with a plate of crudités and an unusual and delicious dip, based on canned tuna. My friend Michelle posted this recipe for Tonnato Sauce two years back, but it only recently caught my eye. 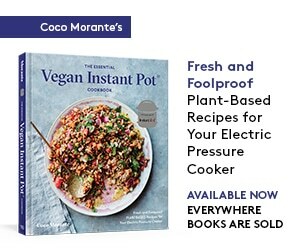 I think she must have mentioned it on her podcast (which is awesome, by the way! ), because when I got home from walking my dog one morning, I couldn’t get it out of my head. The creamy, savory dip includes canned tuna, anchovies and capers, so it’s basically an umami bomb. 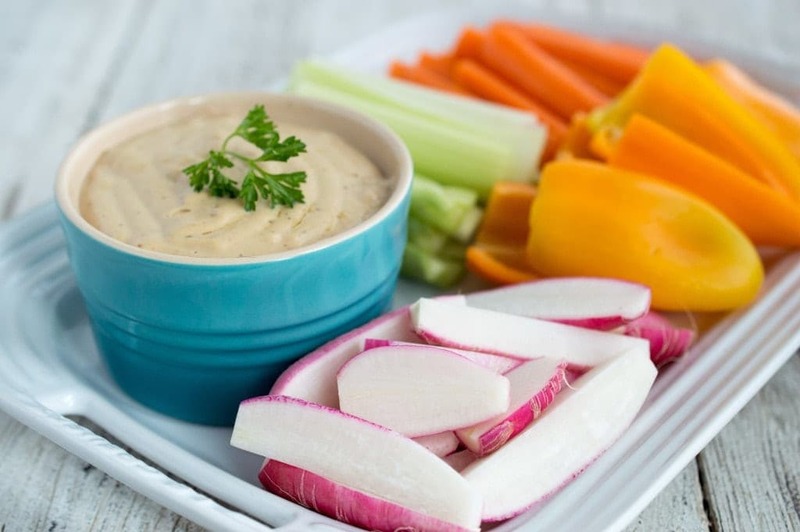 It also has plenty of healthy fats and protein, so a plate of veggies and a little cup of dip will keep you full for a surprisingly long time. I made a couple changes to the recipe, based on what I happened to have around the house. Michelle’s recipe calls for oil-packed tuna, but I went with a water-packed variety. The kind folks at Safe Catch Tuna had sent a can my way a little while back, and this was the perfect opportunity to use it for something besides the usual tuna salad. Oh, and by the way, the Safe Catch tuna is fantastic. It is as moist and delicious straight out of the can as any oil-packed tuna I’ve had (I tried a little flake before it went into the blender with the other ingredients), and I am a big fan of their stringent standards when it comes to mercury testing, as well as responsible fishing practices. A big thanks to them for the sample — I plan on ordering some soon. Other than subbing in water-packed tuna, I also used a combination of Meyer lemon juice and white wine vinegar in place of the regular lemon juice, since that’s what I had on hand. As for the mayo, I used some red pepper-spiked Mason Jar Mayonnaise I’d made a few days ago, with a base of cold-pressed sunflower seed oil. There is some disagreement about the Paleo/Primal-ness of sunflower oil, but you know, sometimes, your best is enough. I look forward to reporting back after my Whole30 is over, and sharing some plan-friendly recipes along the way. Until then, here’s that Nom Nom Paleo Tonnato Sauce. 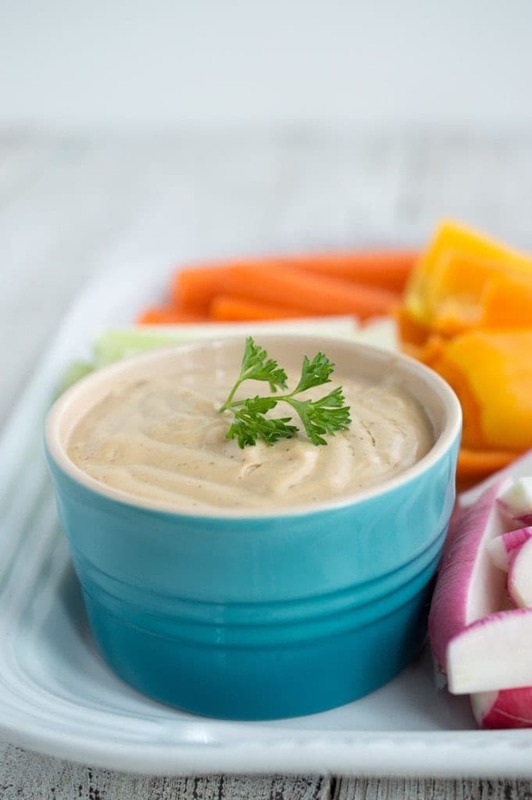 Whether you’re on a Whole30 diet or not, it’s a delicious, satiating snack, perfect with a platter of vegetables, as a salad dressing, or served over chicken or veal, Italian style. Enjoy! 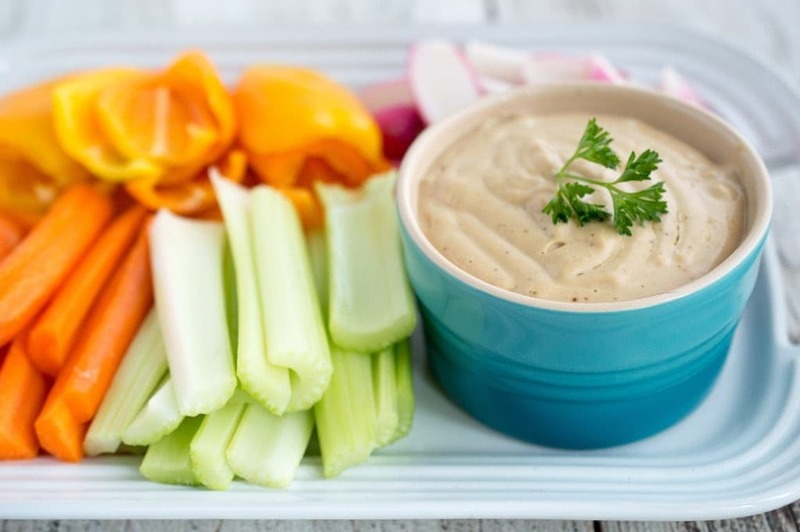 An easy and super-savory veggie dip made from canned tuna. You can also serve it as a salad dressing or sauce for poached or otherwise simply-cooked meats. Combine ingredients in a blender or food processor. Blend at high speed until smooth and creamy. Just found your blog, I also was recently diagnosed with PCOS and have been frustrated by the lack of information for us thin or lean types! Good luck with your Whole30, I’m gearing up to start one to try to get my hormone issues under control. You’ve also inspired me to finally try Nom Nom’s tonnato sauce! You are my inhalation, I have few blogs and often run out from brand :). Thank YOU for the meal!! But yeah, thanks for spending some time to discuss this matter here on your website. goals. I absolutely enjoy reading everything that is posted on your website.Keep the tips coming. I really enjoy studying on this website, it has got excellent articles. I actually still can not quite believe I could often be one of those reading the important guidelines found on your blog. chosen profession path. Many thanks for the important information I got from your site. considerate as well as for pick out varieties of fantastic subjects most people are really needing to learn about. Excellent information over again. Thanks. nice to read this website, and I used to visit this website every day. Hello to every one, because I am actually keen of reading this weblog’s post to be updated daily. I gotta favorite this web site it seems very beneficial very helpful. Great tips! I really like the paleo diet. in changing my eating habits. access to quality paleo diet cookbooks. 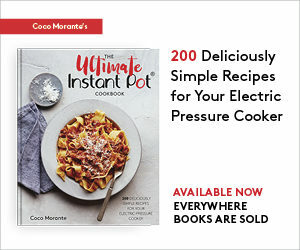 Just recently I found a cookbook that offers 125 paleo recipes complete with a 1-month paleo meal plan. It also gives you Paleo diet shopping lists and tips on how to stay in line with your new diet plan while eating out. The recipes are mouth-watering and there’s plenty of tips to help you jumpstart your diet.